Munich - With Mario Mandzukic and Claudio Pizarro knocking the goals in, Bayern Munich are in something of a comfort zone with their attack. Mandzukic leads the Bundesliga scoring charts with eight goals while Pizarro’s hat-trick in the UEFA Champions League against LOSC Lille shows he is a perfect decoy to the Croatian, so what more could they want? 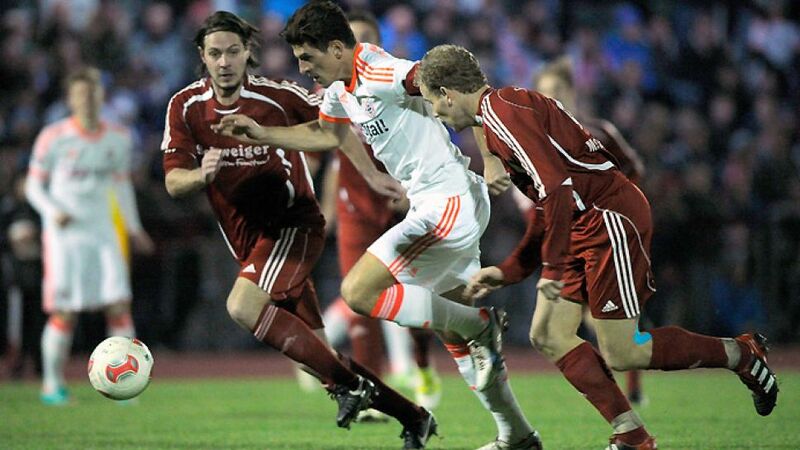 Enter Mario Gomez. The Germany international has almost been forgotten after an ankle injury in August consigned him to a lengthy spell on the sidelines. However, away from the glare of Germany preparing to face the Netherlands in their final international match of 2012, the village of Markt Schwaben in Bavaria witnessed the return of the comeback kid. "It's not like I've been away for six years," he beamed after bagging four goals in a 90-minute run-out in a game arranged mainly for his benefit. "Let's not exaggerate, they weren't the toughest of opponents." While the sixth-division status of the opponents Gomez faced on Tuesday put his feat in perspective, it still does not hide the fact that the 27-year-old is about to give head coach Jupp Heynckes a major selection headache in the run-up to Christmas. "I'm very happy," quipped the Bayern coach. "It was a very positive game for an hour, not just from Mario, but from the whole team." That team included Pizarro, who was also on target in a 6-0 triumph, and up-and-coming midfielder Mitchell Weiser, who stuck his name on the scoresheet for good measure. Heynckes therefore has plenty to ponder as he prepares his side for their last nine games of the calendar year. Those games, including decisive Champions League encounters with Valencia and BATE Borisov, and key Bundesliga clashes against Borussia Dortmund and Hannover, not to mention the last-16 DFB Cup tie against Augsburg, are all squeezed in to a period of just 33 days. That gives Heynckes plenty of opportunities to rotate his side, and ease Gomez back into first-team action, which could even come at the weekend in the Bavarian derby with Nuremberg. "I've not decided that yet," said Heynckes, who is at least giving it some thought as Gomez gets warmed up for his return.